No one goes hunting for a new home hoping to score a small kitchen. Unless you’re actually shopping for a tiny home, a bigger kitchen is bound to woo buyers way more than a cramped one. Sometimes it can even make or break the sale. If you currently find yourself in a cramped kitchen situation, we’re here to tell you that there are ways to make this room appear larger. All you need to do is embrace a few simple—and smart—decor ideas. So while your petite kitchen may hinder your efforts to bake 200 Christmas cookies in a day or cook Thanksgiving for dozens with ease, you can give the impression that the room is more spacious with the following tricks. White is clean, fresh—and opens up a room like no other shade. Lighter walls, floors, and countertops reflect light better than darker shades, says Amy Ahearn, owner of Decorating Den Interiors in Williamsburg, VA. If you want to add some dimension or depth to your white kitchen, Ahearn recommends applying a glaze or use high-gloss paint for a lacquerlike finish. Not into white on white? Karen Gray-Plaisted of Design Solutions KGP says using one color—maybe light gray or muted yellow—will also do the trick. “A monochromatic color scheme makes a small kitchen feel larger,” she says. 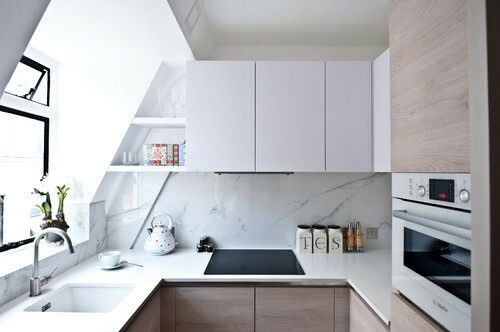 If you do choose white cabinets, continue the theme with white appliances, flooring, countertops, and the sink, says Justin Riordan, founder of Spade and Archer Design Agency. “Using a single color removes the edges and makes your space feel bigger,” Riordan explains. 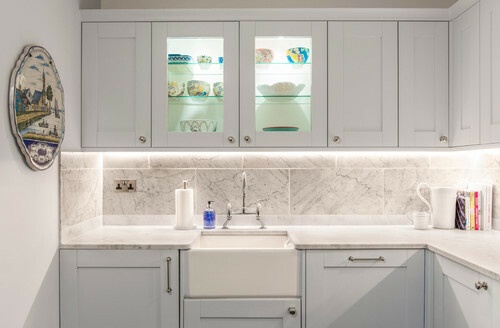 If you’re looking to renovate your small kitchen, think beyond standard wooden cabinets. 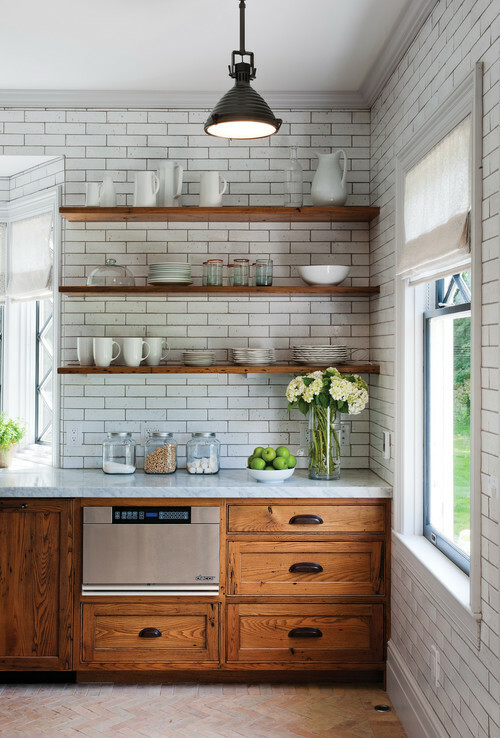 Instead, opt for floating shelves with minimal brackets to make the space above the countertops look less bulky. “Floating shelves are the most streamlined,” Ahearn says. And remember to follow the cardinal rule of open shelving: Organize your items scrupulously or they’ll look like a hot mess and your tiny kitchen will feel less spacious. A chair rail or wall trim like crown molding forces your eye to stop and take in these details, rather than scan the room as a single, wide-open space. “Each extra piece in an already diminutive kitchen cuts the room into smaller visual pieces, so the fewer transitions you have, the larger it feels,” says Riordan. Mirrors are the back-pocket trick that every interior designer uses to amplify small rooms. 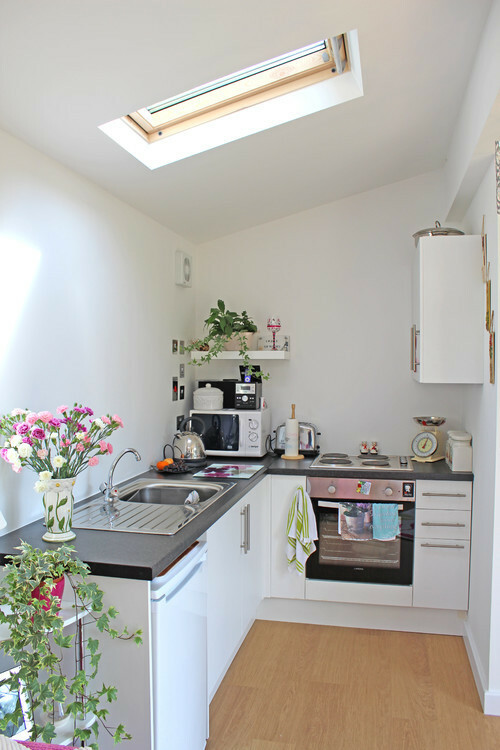 That’s why we love the idea of incorporating them into a small kitchen to make the space feel roomier. 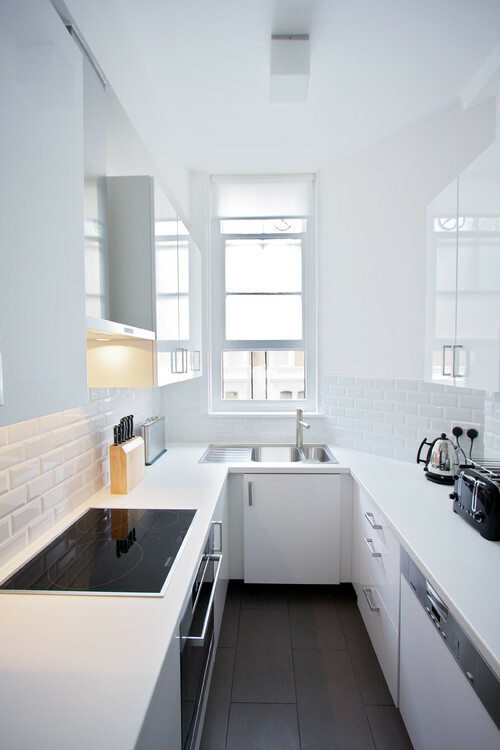 A cramped kitchen will instantly feel larger as light bounces off surfaces and reflects the room. Not a fan of mirrors? Glass-front cabinets work in a similar way, offering an airy, open feeling. 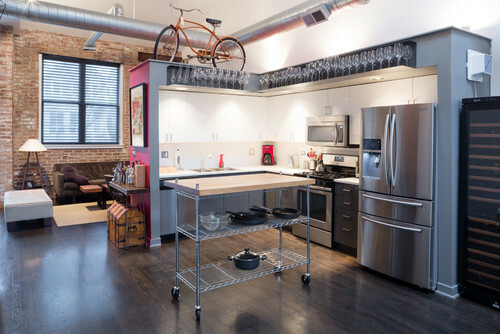 Yes, you can have an island in a small kitchen—just steer clear of the chunky, boxy ones. “Pick a piece that’s open at the bottom, with exposed legs, rather than a cabinet that’s closed on all sides,” says Ahearn. 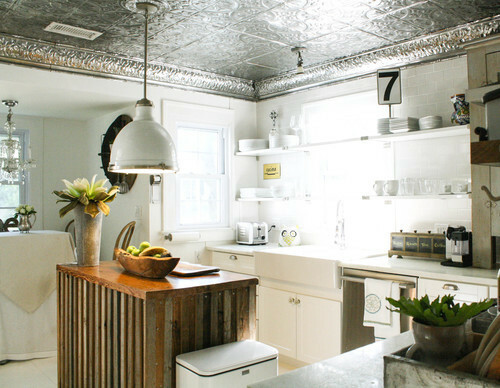 “Add interest to your ceiling with pressed tin, funky tile, wallpaper, beams, or bead board,” says Ahearn. This smart design hack will draw the eye upward and give the illusion that the room is larger. You can also encourage height by storing infrequently used items in the open space above cabinets, suggests Gray-Plaisted. Clutter makes any small space feel even more cramped. To make your small kitchen feel larger, it’s important to keep the counters as empty as possible. Of course, that doesn’t mean you need to part with your toaster and stuffed utensil jar, but stashing them off the countertop is a must in a small kitchen. If you’re short on cabinet space (or have gone the open shelving route), Ahearn suggests investing in a system that lets you hang things on your backsplash. 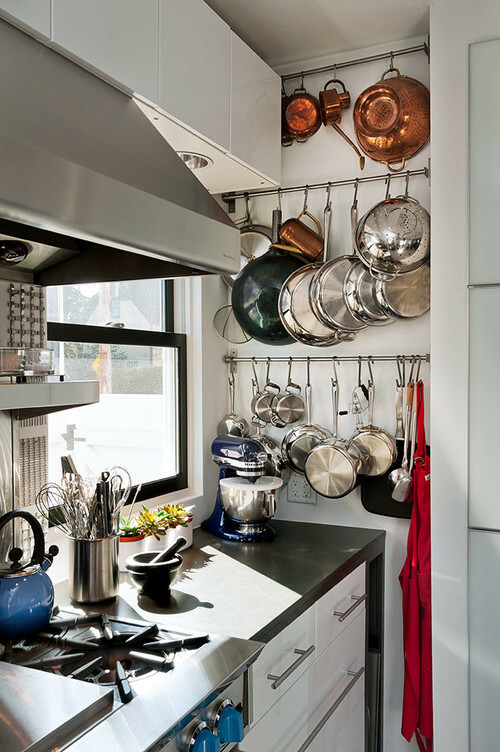 Sure, a rack to hang your pots and pans is smart—but it’s the placement that’s key here. Hanging it on the ceiling gives the impression that it’s bearing down on you (and closing off the room). Instead, install it on a wall. Bulky light fixtures have no place in a small kitchen. Instead, go with recessed lights, which are recommended by design pros for a neater, open look. 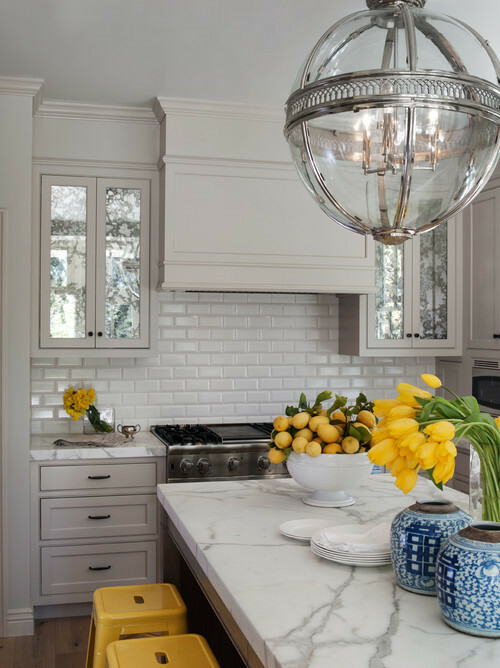 “Rather than hang a pendant over your sink, put in a puck light,” says Ahearn. You can also install an LED strip on the inside of your glass-front cabinets or along floating shelves to flood the space with light. The post Want More Space? 9 Genius Ways to Make a Small Kitchen Feel Bigger appeared first on Real Estate News & Insights | realtor.com®.